This week’s discussion in class was very interesting as Allison discussed text and how it is displayed in a binary environment. We considered how text is displayed while under binary conditions. An interesting moment that was proposed was when we looked at a piece of interactive text that introduced randomness. When asked if it was still considered text, I considered it no, giving the reply that text should be static. Looking back, I think static is the wrong terminology, and I propose that text should instead be reproducible. The development of writing systems was to create the ability to put down thoughts in a way that can be reproduced and conveyed to the world. This leads to the creation of “sacred texts” and text works that remain through a great period of time. So I will double down on the idea that interactive randomly generated type is no longer considered a “text”. But back to the assignment of the week which was to create a piece of art in the terminal using ANSI encoded type. ANSI being the organization that creates standards for American products, systems, and services. They coordinate with international standards so that American produts can be used worldwide. ANSI developed the ASCII character encoding set, an 8-bit character set that allows the representation of the alphabet and related symbols and commands such as carriage returns and line breaks. Related to ASCII is the Unicode Standard, a 32-bit character set that extends ANSI encoding to allow for more representations for a more complicated world. That way we can do things like this: 💁. 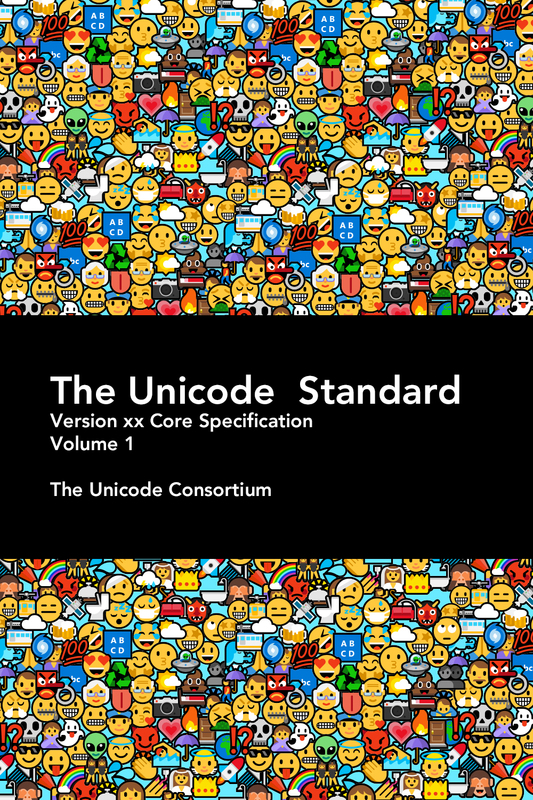 On a side note, the Unicode Consortium, an organization similar to ANSI, hosts a book cover competition when they release new standards. This July 2018 they released a new standard and I submitted this for the competition as well as an essay about how the inclusion of emoji characters revolutionized digital communication. The homework assignment was to create artwork with a terminal emulator. This combines two of my favorite things: terminal and typographic drawings! Last year I attended ITP Camp and there was a guy named Pierre De Paz who led a session on drawing in the terminal. In his workshop he used python as the console language, and I liked it so much I created my own wrapper library for nodejs in order to live code terminal drawings with Nodejs REPL. Anyways this is my exposure to terminal drawings. For this assignment I wanted to continue the experiments with the actual terminal, I think my computer is allergic to p5js since it always runs very slow for me, expecially p5 web editor. I chose python as my console language in the spirit of Pierre because I’m kind of aesthetically annoyed that nodejs always seems to append the return value in function calls and I couldn’t find a way to disable it. Stack Overflow doesn’t seem to know either. So I whipped up some python scripts to make some visual drawings in the terminal. I think to complicate the idea of using the text-based console as a visual medium I only used spaces and color for my drawing. And since I love emojis I ported the stars example to python. Also I receated the ubiquitous snowfall terminal app. But my school laptop doesn’t like emojis that much (and gravity flows up in emojiworld). All in all a fun afternoon.